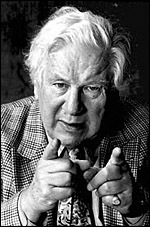 Peter Ustinov was interviewed by Sheridan Morley at the National Film Theatre on 7 April 1990. SM: But how in these years were you regarded by the English? Were you the kind of boy prodigy still, or were you too clever by half, or a bit foreign and not to be trusted, or what was the general English cinema feeling about you and your work in the early years? PU: Well, it was in a pretty transitory period, because it was dominated by Rank, who was a very nice man but didn't really understand very closely what was going on. His real interest was still bread. PU: Yes, flour mills, but also he was very close to Hovis and other people and that sort. And he didn't really understand. I went, he asked me to dinner, and I remember going there, and he was a teetotaler, of course, a very strict teetotaler, and he said, "Would you care for a sherry?" without really knowing what he was talking about. [Laughter] And he had a very, very old butler in The Grosvenor House or wherever he lived, Dorchester, and who gave me a tumbler full of sherry. [Laughter] And I had to drive to Newcastle overnight. I took the tumbler and it was brandy. He'd made a double mistake. And I drained the glass of brandy in order to show that I, to show willing, and I was only about twenty-five years old, but I was, I remember at one point in the evening, which was not at all successful, saying to him, "You've got a contract", 'cause there was a bit of lint on his clothes, and he didn't react to that. He was thinking, thinking of a loaf or something. [Laughter] And after dinner they gave me, he said, "I think people take brandy after". [Laughter] And they gave me a very thin, small glass and it was sherry. [Laughter] So I suspected I didn't have much future in the British film industry under those conditions. SM: We had a question about your early teenage years and films, and particularly about a Will Hay film called The Goose Steps Out. SM: Does that ring a bell? SM: We seem to have left it off the film chart, so our apologies for that. But tell us about Will Hay. Was that a formative - ? SM: Vice Versa - you were barely out of your teens. You were allowed to direct, to write, to organise. Why was such faith put in you so early in your - ? PU: That was my second film. PU: I'd done School for Secrets before with Ralph Richardson. I did that when I was twenty-four, and as usual when you're twenty-four you think they've left it rather late to give you the chance. What do they think they're doing? [Laughter] But that was a big success of the kind that one had in those days, and looking at it now, it's really, I think, dated much more than Vice Versa, which is really quite modern in certain ways. But that was one of those wartime films which is quite efficient, but in which I invented a kind of parody of the kind of films which Jack Hawkins used to appear in with Dickie Attenborough, which, on the bridge, Hawkins would say, "Thank you, [unintelligible], that'll be all," and Dickie would say, "Thank you, Sir. And Sir?" "Yes?" "Nothing, Sir." [Laughter] A particularly kind of English understatement, which was very popular. SM: So by the time you got to Vice Versa, had you decided that your life was going to be, what, writing films? Directing them? Starring in them? PU: I really wanted to write more than anything, and I was given the chance of doing that. It wasn't an enormous success. I find it much funnier now than people found it then. And, but still I was given a chance to do a third film, which was Private Angelo. SM: And that did start a line in, as I was saying briefly earlier, there's a line of anti-war pacifism that goes right through to Romanoff and Juliet to The Unknown Soldier in your stage plays. PU: Well, yes, of course, if at a very formative age you're propelled into the army, especially after you've left school and the drama school, and not yet had the opportunity to exploit the sudden freedom which all young people need at a certain time in their life, but are plunged right back into school again - and the army's nothing but another kind of school with more lethal punishments, if you stick your head up at the wrong moment - then obviously you're very impressed and I was in the army as a private for four-and-a-half years at a very impressionable age. And I got a view of generals and things from underneath, and I must say I hated every minute of it, but I knew at the time that it would be wonderful material, so I watched like a hawk. PU: Oh yes, very much so. PU: Yes, well that was really the pilot. Not the penchant, but the ordinary pilot of all the other ones, and of course, in those days, I think they tried to get as near the bone as possible. It was a battle between good and evil, and good always won by a photo finish at the end so that it got the Vatican seal of approval and all sorts of other things like that. And of course even the orgies all looked like underwater ballet. [Laughter] People floating towards each other - there was an element of absurdity in the whole thing. SM: And you were giving your Nero. PU: I was giving my Nero, and I remember this: it was going to be John Huston. SM: You mean playing it or acting it? SM: But did Quo Vadis? open up for you a whole world of mad, gay Roman emperors in Hollywood movies or? PU: Yes, it did. Well, no, not, they weren't all gay [Laughter] and I, but I remember, as I say in my one man show, Mervin LeRoy's only comment on the part, before we actually started, which was, "The way I see Nero, he's the kinda guy plays with himself nights". [Laughter] So I remember thinking that it was rather absurd, but then now, I'm beginning to wonder if that isn't the profoundest thing ever said about Nero. [Laughter] Probably exactly the way he ought to be played. And then I go on, and it was a conviction which began then, forty years ago, whatever it is, but has really hardened into a conviction now, that the Americans are the only people that can do Ancient Rome justice, because they're so terribly alike. PU: Well, I think it's a misnomer to call it an industry. I think it's even a misnomer to call it an industry in America. It was an industry for a while when Jack Warner said, seeing a cowboy film on the screen, said, "Great, give me forty like that". [Laughter] Those were the times when Ronald Reagan made one film after the other without having to dismount. [Laughter] Then it was conceivably an industry but now, like everything else, it's become so expensive, that really what I find difficult to - why I find it difficult to call it an industry is can you imagine how General Motors or Ford would survive if every car had to be different? And this is really what we're up against, because everything has to be different. They never copy each other until a thing is an enormous success. If they had something like Easy Rider about somebody crossing the United States by motorbicycle, they suddenly all think, "There's something in that story that pleases people. We'll have people going across America on their knees, on sand". [Laughter] Then you get a kind of moment of industrial power, then it all sags again when everything goes wrong, 'cause they've been across America in a motorbike, they don't want to go across again by other means. And so I just don't think it's an industry. I think it has to be taken as an art of sort, but it's not really an art either. It's becoming more of an art because you can now see on the screen what you're doing, but before, when all those great people were active that you all know about, all the great directors of the past, they never saw what they'd actually - the cameraman was the first person to see what they were going to see on the screen, because he saw not only what was going on, he saw the frame as well. But otherwise, it's very difficult to imagine, really. You can think what you see, but very often - and also, let's face it, it's a collective art of a sort, because if a great director is used to working with a specific cameraman like Bergman does with Nykvist, well, he wants Nykvist, and Nykvist is suddenly engaged somewhere else, he's already got to use another cameraman, and already the final result is going to be slightly different to what he hoped for. And in an industry this is going on all the time, of course. So I think obviously we need our identity. I think our identity is a very interesting and a very strong one. It's expressed very often through some very good television, which is the poor man's film, and they're becoming more and more alike as money from television's going into films and all the rest of it.